You don’t have time to read this book. That’s partly the point. It’s not that it’s too long or too dense or too technical. You don’t have time to read this book because you are busy. You have more to do in a day than most people who have ever walked the earth. You have to respond to emails; you have to put numbers into a spreadsheet; merge the contacts on your phone again; see who tagged you on Facebook and why. Or do you? 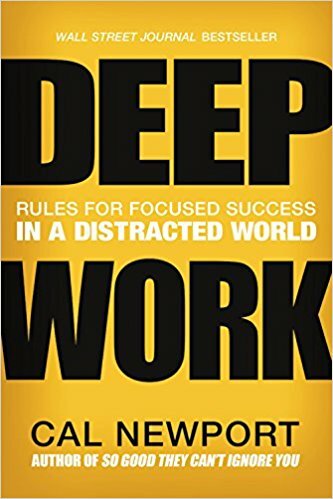 Cal Newport, Associate Professor of Computer Science at Georgetown, sees that this state of distraction, drastically inhibits the sort of intentional focus and dedication required to perform what he has coined “deep work.” He defines deep work as those “professional activities performed in a state of distraction-free concentration that push your cognitive capabilities to their limit. These efforts create new value, improve your skill, and are hard to replicate. “The Idea” (Part 1) is that Deep work is valuable, rare, and meaningful. This is the portion of the book where Newport develops and presents a case for the concept. He first locates the value of deep work in its present necessity, identifying it as a key to success in a rapidly changing marketplace. Furthermore, it is paramount to learning the difficult skills that set one apart from professional peers. Thus, economically speaking, the value of deep work is quantifiable. Deep work is also rare in a time when it is more important to produce results that can be immediately measured, and being busy is confused with being truly productive. To cap the apology for deep work, Newport argues that it is meaningful in and of itself. In this third chapter, he makes a neurological and philosophical case for deep work. This is more than just a third point. Newport sees this argument as part of the glue that holds together the case he’s been building thus far. “The Rules” (Part 2) is primarily what you came for. Work Deeply (Rule 1); Embrace Boredom (Rule 2); Quit Social Media (Rule 3); and Drain the Shallows (Rule 4). Though the reader will immediately see the potential value in following the four rules to create the capacity for deep work, Newport gives you the why. That’s part of what makes this book more than an instruction manual. The rules are simple, but not easy. Newport is convinced that you’re more likely to embrace them when you understand the “why” and the “how.” For example, completely quitting social media may be not an absolute necessity depending on your own industry and goals; but as a farmer considers what tools help him accomplish his goals and what tools will hold him back, so also the “knowledge worker”—a term Newport frequently uses—must be exceptionally discerning when selecting what tools merit a place in the proverbial barn. Those frequently reading The Beggars Blog may notice that this is not a spiritual text. Newport does not appear to have members of the clergy especially in mind. In Part 1, for example, a pastor (and perhaps many Christians) may be put-off about the monetary motivations for engaging in deep work, and miss the overarching value and intent of the discipline. Because the case for deep work is convincingly summarized in the introduction, the reader will be tempted to skim or skip Part 1. I recommend reading through anyways, as skipping through will cause you to miss valuable nuggets that fit in with later examples. As for the rules of Part 2: don’t fear them. Newport is aware that a one-size-fits-all application will be met with failure by the vast majority of potential adherents. To this end, he presents several means and methods for people in various professional circumstances so they can maximize their cognitive capacity and achieve truly deep work. It may seem too broad of an endorsement, but I would recommend this book to just about anyone. But in light of this forum and my own particular calling, the “knowledge workers” who rise first in my mind are students, professors, and pastors. Context may dictate otherwise, but these vocations offer tremendous professional latitude. There’s rarely a “boss” around every corner to make sure they’re “being productive.” Neither are there many strict guidelines on how they must spend their time. Nevertheless, most of the real work requires focus, clear thought, and dedication—that is, if one is going to do the job well. Furthermore, given a largely unregulated schedule, these professionals are in the perfect position to apply the rules set forth, and perform truly deep work for the betterment of self and others. A closing note on a spiritual matter: One practical outcome of Deep Work is that it provides a means to make the reader a better steward. The use of God-given reason to the ends presented in the book is, for the Christian, utterly ministerial. Not only may we become better stewards of our many first-article gifts, but also be more faithful in other vocations (e.g. parent, spouse, etc.) For the Christian, the applications of Deep Work go beyond earnings and prestige; they extend to those who matter more than we. To hear an interview of Cal Newport in which his book is applied to the work of the pastoral office, follow this link. Rev. James P. Hopkins, Pastor of Lutheran Church of The Way in Raynham, MA.